Thirsty for homegrown flavors? Columbus is the city for you. We&apos;ve got distilleries, cocktail bars, microbreweries and coffee shops all over the city, using the finest local ingredients to bring you the perfect drink. 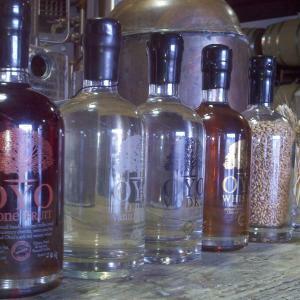 Middle West Spirits redefines vodka with its flavorful OYO, perfect for sipping neat. Watershed Distillery&apos;s Four Peel Gin plays up citrus notes and plays down piney flavors, making it a great addition to summery cocktails. Both distilleries offer tours. MOUTON and M are among the many Columbus bars and restaurants mixing creative cocktails with our homegrown spirits. Columbus has long been known for its beer tradition - after all - we do have a whole neighborhood called the Brewery District. Columbus Brewing Company, Elevator Brewery and Barley&apos;s have been making great beer here for years. In the past year, though, there&apos;s been an upsurge of microbreweries all over the city. Whenever you visit, you&apos;ll find a new brew waiting for you. And for a horse of a different color, Brothers Drake crafts mead, or honey wine, from all natural Ohio honey. The tasting bar is a stylish spot for an after-dinner drink. Of course, you don&apos;t have to be a drinker to enjoy Columbus&apos; booming coffee scene. Anchored by Café Brioso, we&apos;re experiencing an explosion of small-batch roasters and coffee shops wholeheartedly dedicated to cupping the perfect latte. Find more great places to have a sip on our Columbus Drinks Pinterest board.